Finally MechJeb is for KSP 1.2! Can you please update to 1.2? help, can't get it to show up in game. Any idea when the 1.2 update is coming out? Hi All, for those of you having "issues" with the latest release of Mechjeb especially with the landing issue (Hury999), build 574 works jus fine. It still has the spinning camera thing when hovering the mouse over MJ GUI but I can live with that. Another issue is the time warp on reentry, I think it may have something to do with KJR. Anyway, here is a quick fix for all you MJ junkies until a new release comes out. Many thanks to the Devs for this wonderful mod. on the new core. Other Mods that were stable now exploding. I love what this mod can do. I haven't seen any of it first hand since I just downloaded it and i'm tinkering around. But, I noticed something. First of all, the moment I put the pod on a ship of mine, I cant go back an edit it. Whenever I go back into the VAH I can not see my ship, just the sky(?). Even if I just use the pod. Why is this? MechJeb I have to admit, is a little wonky sometimes. But it is probably the most useful, helpful, and valuable mod available for KSP. Massive kudos to the mod author(s). Hi, I have a problem with Mechjeb, Ascent guidance does not appear in career mode. I see it briefly for about a second when my rocket appears on the launchpad, but then it disappears. I tested with Sandbox and it worked perfectly. I have unlocked the science node. Is there something I'm doing wrong, or is my ship not built well? because I tested the ship manually and I was able to get into orbit. Using version 2.5.5 on KSP 1.0.5. Hello everyone. First off, great project. Have used MechJeb since release... any hints, comments about when a new version will be released for 1.0.5 of KSP? Thank you. Trying to use Landing Guidance to put a lander on the Kerbin Polar Caps. Are flight computers on real spacecraft for newbs as well? 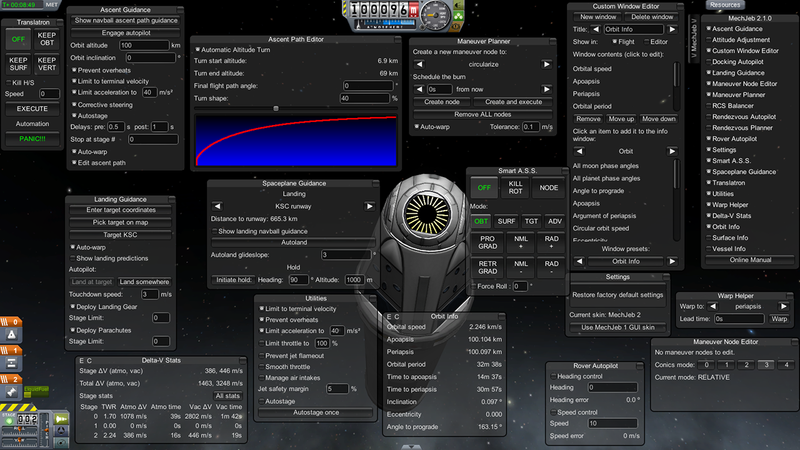 Mechjeb is also for experienced players who have mastered orbital dynamics in KSP and don't want to do it all manually anymore. In fact. I suggest for someone who doesn't want the simplicity of mechjeb to use it only after failing to accomplish the mission in full-manual mode first. mechjeb would help a lot because all the TIME it takes to get my mouse movements PERFECT to get the alignments i KNOW i should have to make a correct orbital rendevous puts me behind schedule for another task i should be working on.